If ever a colossus strode across the Indian legal arena, it was Nani Palkhivala. After a brilliant academic career, he quickly became one of India’s most sought after lawyers and remained at center stage for five decades. Famous for his phenomenal power of concentration and persuasive advocacy, he was a supremely successful lawyer. Early in his career, he authored one of the finest commentaries on the law and practice of income tax. His reputation as a constitutional lawyer is deservedly formidable. Between 1965 and 1995, he argued nearly all important constitutional law cases before the Supreme Court of India: Golak Nath, Bank Nationalisation, Privy Purses, Kesavananda Bharati, St. Xavier’s, Mandal Commission and the Election Commission matter. Palkhivala also represented India in three major international disputes. A man of many parts and strong opinions, he gave critical lectures on the annual budget, which attracted audiences in excess of 1,00,000. Amazingly, he never referred to a single note. An extraordinary human being, he gave generously, but quietly, to charitable causes. 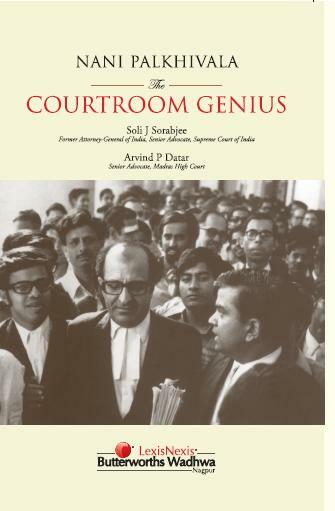 This book chronicles Palkhivala’s journey as a lawyer and discusses the important cases in which he appeared and that changed the destiny of the country. The book provides a rare insight into his working methods and style of advocacy. No student of law, no lawyer, no chartered accountant, no member of the judiciary, and no well-informed citizen can afford to miss reading this book.